Watching Olbermann Watch: Adios Bob! 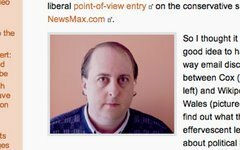 Bob Cox is exploring the possibility of shutting down OlbermannWatch. With the recent announcement that NBC Universal has signed Keith Olbermann to a new multi-million dollar, multi-year contract, the time has come to consider whether Olbermann Watch continues to serve a valuable role as a watchdog site. One would think that a multi-million dollar, multi-year contract would only increase the need for a "watchdog" site, but OlbermannWatch has never had a particularly close relationship to the demands of impartial logic. What's the real reason Bob is considering closing OlbermannWatch? It's clear to me that TND has too much right-of-center baggage to be an effective platform from which to advance the non-partisan agenda of the Media Bloggers Association. I believe I can be a far more effective advocate for the MBA - and establish myself as a thought-leader on blogging and citizen media - by creating an entirely new blog. Maybe folks will see this as somewhat pointless in that I am still the same person and I am still going to have the same opinions. Maybe they're right but I feel that that the time has come to break with my TND-self and start a new chapter in my blogging career. What better way than with a new personal blog with a new more constructive tone; a blog devoted to my work as President of the Media Bloggers Association. Like the National Debate, OlbermannWatch has become a handicap for Bob's career aspirations. Bob has a long history of fostering a venomous internet culture based on bullying, intimidation, and irresponsible interpretations of fact. He's attempting to transform that particular brand of poison into a career as an advocate for the blogging community as a whole. Good luck with that, Bob.